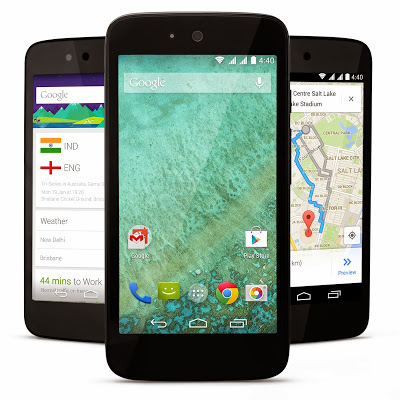 Google officially launches Android One in India which is cheap yet high quality smartphones. Price of Android One is around 6,400 Rupees in India. Google launches low cost android one in India in partnership with Micromax, Spice and Karbonn mobiles to produce Android one devices. These devices are known as the Micromax Canvas A1, Karbonn Sparkle V and the Spice Dream UNO. Google said it is planning to expand Android One to Indonesia, Phillippines and other South Asian countries by the end of 2014 and in more countries in 2015. According to the Google official blog “There are three big reasons why it’s hard for people in countries such as India, Indonesia or the Philippines to get their hands on a high-quality smartphone. First, is the hardware itself. Even entry-level smartphones still remain out of reach for many (bear in mind that in some of these countries the average monthly income is around $250). Second, many people in these markets do not have access to the latest Android software and popular applications. Finally, even where 3G and 4G networks are available, not enough people have phones that can support data and the plans can be expensive. The new android one smartphones includes a 4.5-inch display with a resolution of 845 x 480 pixels, dual-SIM support, Android 4.4 on all devices, and FM radio. Current devices will be powered by quad core Mediatek processors, 1GB of RAM and 4GB storage which can also be expanded up to 32GB through micro SD card slots. These phones also provide the support for many local languages including Hindi. Also the Google apps such as Gmail, Google Maps, YouTube, Google Search, and Google Translate will be pre-loaded on the smart phones. According to the latest update, more hardware partners have also joined the Android One program including Acer, Alcatel, Onetouch, ASUS, HTC, Intex, Lava, Lenovo, Panasonic, Xolo and chipmaker Qualcomm. Three android one smartphones Micromax Canvas A1, Karbonn Sparkle V and Spice Dream Uno were launched today and these are currently available online and you can start buying them from brick and mortar stores from next month onwards. The smartphones will go on sale starting 3.30pm today.